The legendary Bungsamran Lake is a fishing Park situated in Ban Kappi district in Bangkok and is home to some of the largest freshwater fish on the planet. Bungsamran is Thailands premier fishing destination for Mekong Catfish and Giant Siamese Carp holding both species to world record proportions.The lake was formerly dug as a quarry that supplied building material for construction in the city and has been a fishery for about twenty years. Bungsamran Lake covers an area of 20 acres with varying depths ranging between 10 and 25ft. The lake is dissected by a wooden platform (commonly referred to as the ‘shed’) spanning the entire length of the lake in addition to numerous stilted bungalows (private) dotted around the lakes edge. 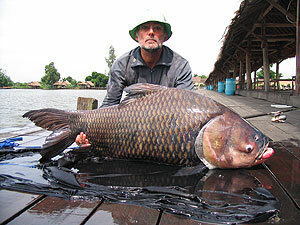 BungsamranLake in Bangkok is host to numerous IGFA world records for various freshwater species including Mekong catfish, Chaophraya Catfish and Giant Siamese Carp. Bungsamran Lake can be described as a highly prolific fishery which can produce upwards of thirty Mekong catfish in a good days angling. The lake responds well to various tactics including sliding float / feeder techniques in addition to method tactics hard on the bottom over large baited areas. Bungsamran is an extremely snaggy and demanding venue and holds some of the largest freshwater fish ever caught on rod and line. The snag ridden nature of this venue often requires the guide to enter the water in order to retrace the mainline after a fish has entered the snags. On finding the where the line exits the snags it is often necessary to cut and rejoin the line in order to regain direct contact with the fish. The predominant species in Bungsamran is the Giant Mekong Catfish which perform spectacular displays throughout the day. Giant Mekong Catfish are present in Bungsamlan to over one hundred kilograms and are caught on a regular basis from this record breaking venue. In addition to Mekong Catfish Bungsamran has an impressive stock of Giant Siamese Carp with weights estimated to reach almost one hundred kilograms. 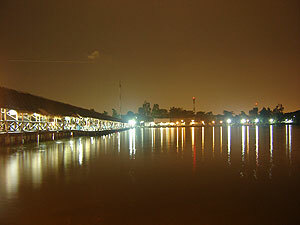 Bungsamran Lake in Bangkok has received numerous stockings over its twenty year history with original stockings of large Giant Siamese Carp and Mekong Catfish caught from nearby rivers. In addition the lake has been stocked with literally thousands of other fish over the past ten years creating what is probably the most prolific catfish lake on the planet. Bungsamran is the ‘ultimate specialist anglers’ destination and will continue to produce world records for many years. Fishing at this venue is available from a public area (‘the shed’) and from private stilted bungalows. Bungsamlan has an on-site restaurant and tackle shop, W.C and shower facilities are also available. 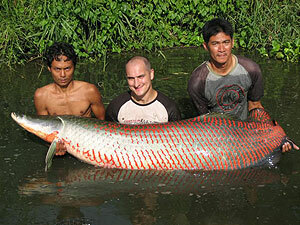 The Fishsiam team has captured numerous monster sized fish from Bungsamran Lake with several Arapaima gigas to a whopping 180kg. In addition the Fishsiam team has successfully captured literally hundreds of Giant Siamese Carp with weights to over sixty kgs from this record breaking venue. Bungsamran has fantastic onsite facilities with a well stocked tackle shop, restaurant, coffee shop, rod builder and massage salon all a stones throw from the swims. Its geographical location in Bangkok means non fishing friends and partners will always be able to find something to do in the city whilst their angling companion spends time at the fishery. This venue can be visited on a daily or weekly basis or combined in one of our multi venue Thailand angling holidays with other venues throughout the land of smiles. For more information about our Thailand fishing tours to Bungsamran in Bangkok for Mekong Catfish and Giant Siamese Carp contact us using the button below.